UPDATE. 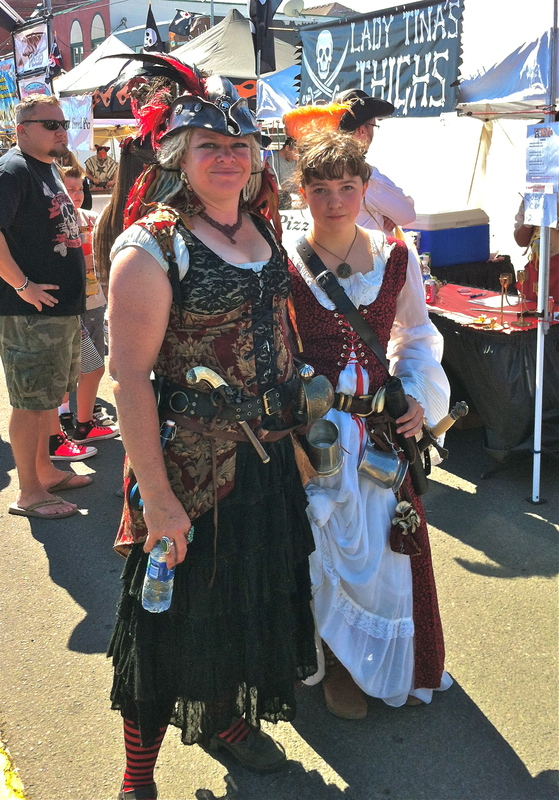 Byron Dazey has put up his wonderful photos of the Portland Pirate Festival. He did a whole photoshoot with the Troupe and the product of all of his hard work can be found HERE. I think you will enjoy them. Make sure you check out the Highlights of the festival too. 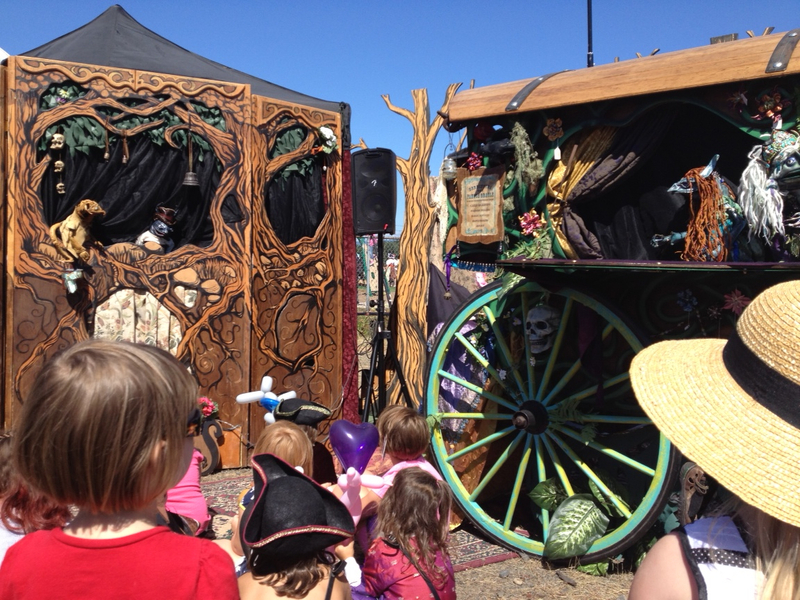 We were surprised how quickly the time between FaerieWorlds and the Portland Pirate Festival went. It seemed like we had just finished unpacking and it was time to get the van all loaded again. 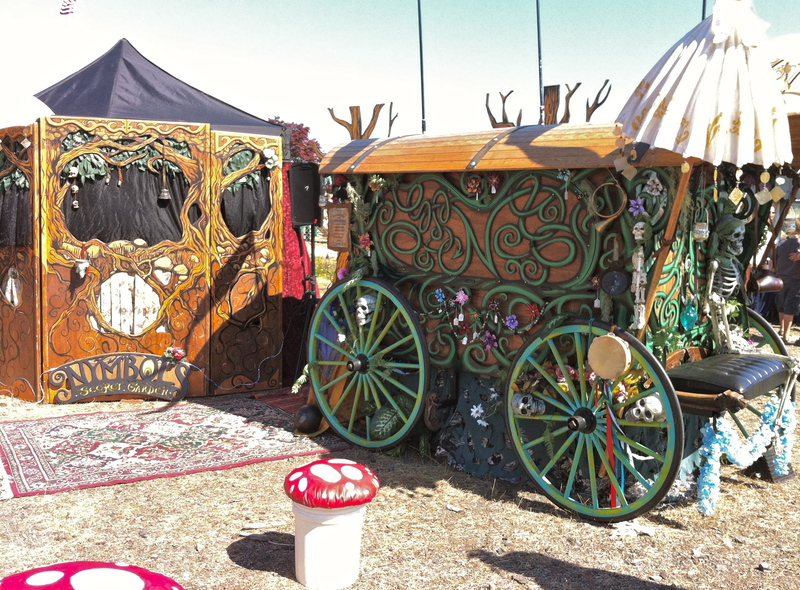 We did fill the time with lots of improvements to the Gypsy Wagon. Most of the things you won’t really see but they are all the things that make it more robust, more functional, more attractive but most importantly,…. “more better” on the trailer. I ordered the bits I needed and called Ryan to see if he had some time. The first glitch in my plan came when I rolled the wagon off the trailer to start on some of the details while we waited for parts. Something wasn’t right, the front wheels should not be able to move side to side like that. I crawled underneath the wagon and found out I had broken the whole “turn of the previous century” steering system into bits. Not good. Making a long story short. Ryan Wright is awesome and we were able to design and fabricate something at his shop that got us rolling again. Better than it ever had. Not only that, I could now strap the wagon onto the trailer without taking anything apart. He also showed me how to tie it down so it would not shift side to side. Once back on the trailer it almost looked like I knew what I was doing. Scary. 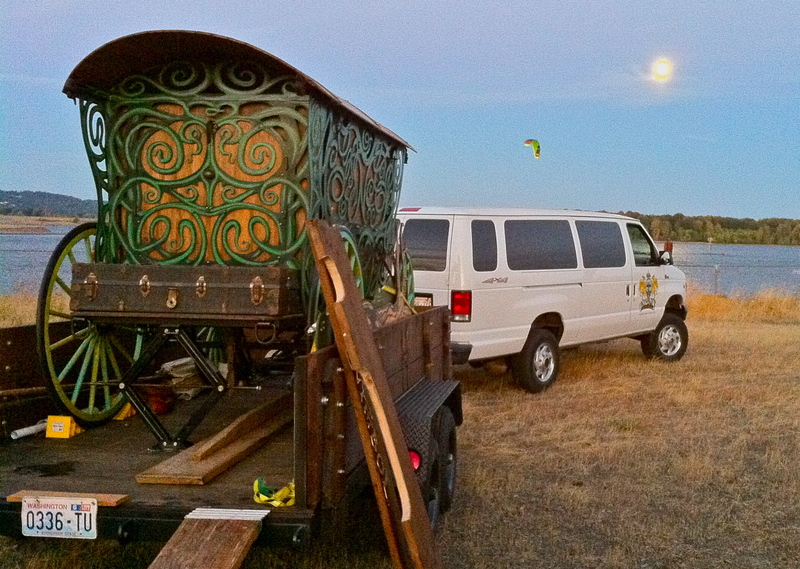 Another new addition to Nymbol rolling troupe is that we finally got some signage for both the wagon and the Van. I created a crest for the van and Jacob Bloom made us a wonderful diecut decal to go on the doors. I also finished making a sign out of the metal we cut out a month or so ago. I can’t believe how much better we feel having a simple graphic on the van and trailer telling the world who we are. 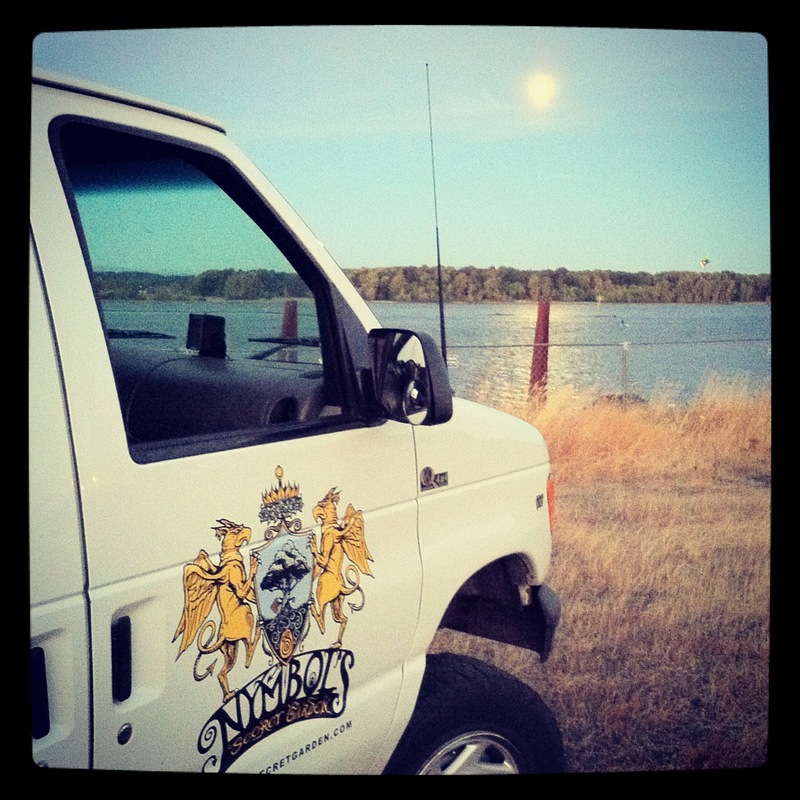 We were now ready to roll and roll we did, without incident, from Whidbey to St. Helens. The only gaff being that if I looked at a map before getting to Portland I could have saved about 35 miles of driving by popping across the river while still in Washington. Lesson learned. We arrived at the site Thursday night and under the biggest and brightest blue moon I can remember got enough of our setup done to enjoy a cup of tea before turning in for the night. I thought we were in for a quiet night next to the river but the fountain in the park beside us and a street sweeper that did laps around our tent at 4am had different ideas. It was still nothing compared to Oregon Country Fair so the girls were well conditioned and prepared to sleep through just about anything with their earplugs. Friday was spent finishing our setup and getting ready for the next couple days. We snuck out to check out St. Helens and get lunch in the old downtown area. There were lots of great shops and restaurants all decorated for the festival. We also found a wonderful thrift shop that provided some new Nymbol props for cheap. By the time we got back the space had been transformed into Pirate tent city. Our neighbors at Oberon’s Tavern and Academia Duellatoria were putting the finishing touches on their area and we knew we were in a good space. Friday night was actually very nice as some lovely chap from the park turned off the fountain and everyone else seemed to go to bed fairly early. The Festival Begins with a bang. Literally. A couple of the Canons are fired in Rapid succession and a surprising amount of revelers roll down the streets in their most piratey frippery. 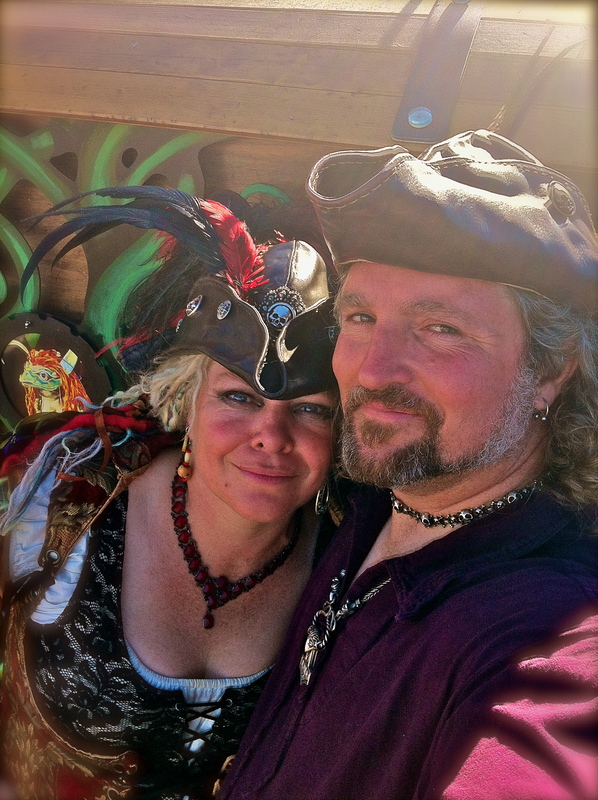 Everyone looks great and there is a reason that men and women alike look so stunning as Pirates. Men look like manly sea adventuring men and the women are all stunning in their own ways. By the time of our first show it was very hot and very crowded. We tried our best to scare off the uninitiated by telling of Silas and Zander and using the word poop as many times as we could in the first few minutes. The landlubbers left and only the heartier souls remained. It was a bit hard to tell if they hated Nymbol, tolerated him, or were just so into their Pirate person a laugh was out of the question. I think the heat is directly related to laughs. Our confidence was then bolstered by seeing some good friends from Portland out in the audience. The first show went o.k. but the second was much better. They had either warmed to us or it had cooled down enough that laughing was acceptable again. Gryph walked the crowd in between shows and got lots of attention. I was good at warning kids that they should not offer him their finger to bite because he will. It is not a pleasant experience. After Hours and after the kids went to bed we did a little bit of a Naught(y) for primetime show. We started with some “Nymbol Bloopers” on our video screen and then had some Special musical guests drop by and sing a few ditties. Some other Pirate revellers joined in and sang a few of their own. It was great fun and we look forward to an even better one next year. Nymbol and Troupe sang a few songs but his voice had left on account of the dust and the sheer number of songs sung that day. It sounded a bit like Nymbol was hitting puberty. The evening was brought to a wonderful close as all the 20 somethings from Oberon’s Tavern revealed their Mouseketeer ambitions by singing loud and proud versions of every modern era Disney movie they could think of. Even though a couple of them had nice voices the sound was akin skinning a basket full of kittens while watching an old Video tape of the Mickey Mouse Club. My children were torn between trying to school them on the proper notes or just jamming their earplugs in a little deeper. It also may have been that it was at 2am. Sunday was off to an earlyish start when Byron Dazey came over and we took the whole troupe around and they posed for some photos. Knowing what Byron has shot in the past and the fun we were having leads me to believe there are going to be some AWESOME shots. I got to see a few on the camera and am very excited. Our shows on Sunday were off to a bit of a rough start as I completely boffed the music we brought to sing along with. In between shows the girls went over to take some sword fighting classes as we ran around with Nymbol shot some video. Our first stop was over to the area with the canons to watch a unique and very real Pirate Wedding. Everyone looked stunning in their outfits as the bride was led in by the Redcoats. We watched the procession and the 10 gun salute and then left them to all that wordy and mushy stuff. I think Nymbol did get a little verklempt though. The second show was much better and we were more than a little sad that it was already over. Serriffina finished the festival by reading Tarot cards for a bunch of folks and she was on fire. We enjoyed the rest of the night taking in the last breaths of the festival along with more scrumptious food. 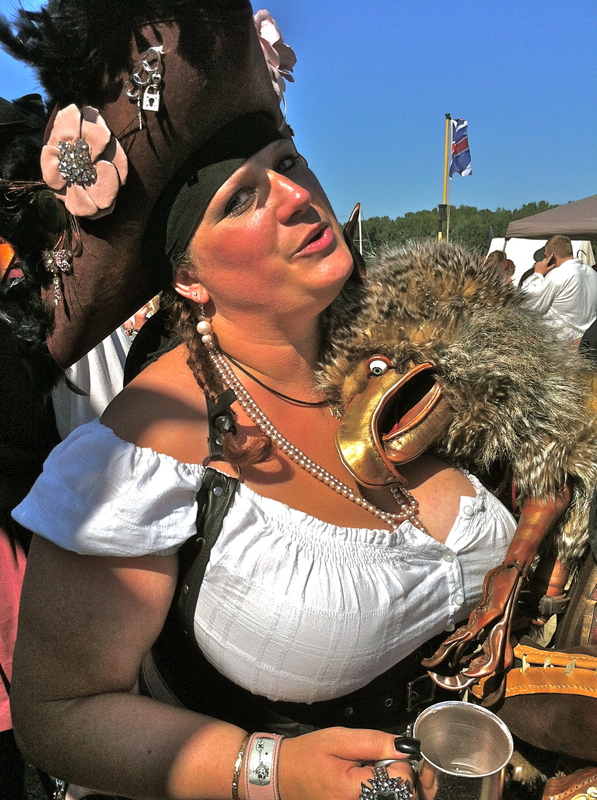 It was all over far too quickly and Nymbol and Troupe felt very welcomed by all the players, vendors, and crusty Pirates. The next morning tear down went quickly and we even had time to go get some lunch before our tent locked trailer was freed to take on the wagon again. As we rolled into Portland to visit with some good friends for the evening I had to stop Sam from listing out all the things we were going to do better next year. With a cup of coffee in our very Piratey Quick Silver Mugs we rolled down route 30 basking in the glow of a great weekend. Thanks so much to Shuhe and Kate for letting us be part of your adventure. Great food, great vendors, well organized, and fun for the whole family. We are already looking forward to next year. Sam ,you look sumpuous and Bill ,the beard looks truly piratey.Ilove the word “frippery” and verklempt! Enjoyed chatting with you and your daughter on Saturday (and exploring comedy on youtube). Thanks for stopping by Word for Word & hope to see you next year!